Preheat oven to 350°F. Spray a sheet pan with non-stick cooking spray, parchment paper or silicone baking mat. In a large bowl, combine the Greek yogurt (strain out any liquid on top) and self-rising flour until a dough starts to form. Turn dough out on a lightly floured surface. Put a little flour on your hands for kneading. Knead the dough slightly and divide into 4 parts. Roll out each part into a rope (about ¾” thick) and pinch the ends of each rope together to make a circle. Brush tops with egg wash. Sprinkle with Trader Joe’s “Everything but the Bagel” seasoning or any other seasoning you prefer, if desired. Bake for 23 minutes. Remove pan from oven and raise oven temperature to 500°F. Return pan to oven and bake for 2-3 minutes to brown. 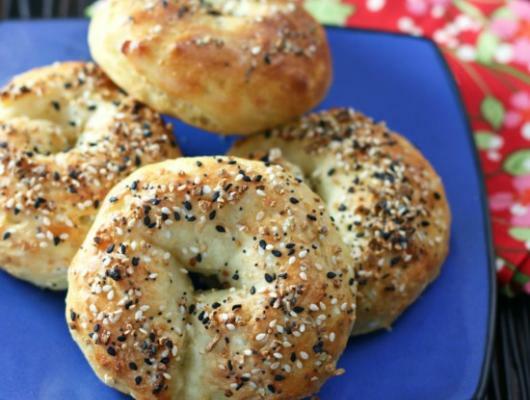 These Yummy homemade 2 Ingredient Bagels are low calorie, low carb and non-fat! They’re Soft, Chewy and most of all, EASY! 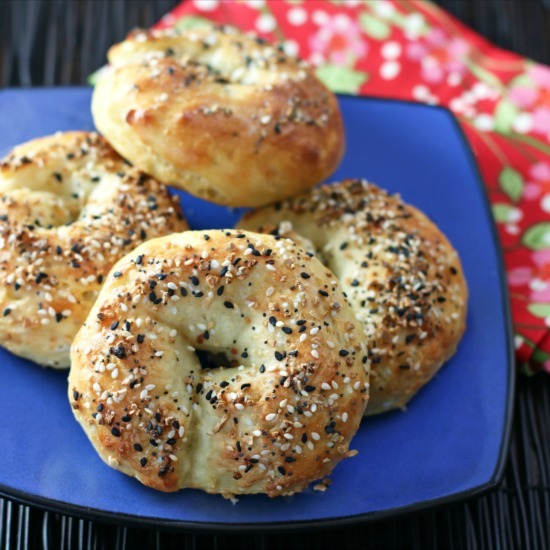 No yeast or proofing required and this breakfast treat is ready in only 35 minutes! Also, they are only 3 points on Weight Watchers!